If you abhorred the darker side of Christmas in 2003′s ‘Bad Santa,’ you aren’t likely to find much more light in the 2016 sequel ‘Bad Santa 2,’ in theaters everywhere. Returning some thirteen years later is the same level of misogyny and crassness that made the initial feature such a refreshing change of pace to the typical Tim Allen-style Christmas film. But where the original was a trailblazer, the sequel leans a bit too heavily on the same jokes, knocks and overall insults that we’ve seen already – and in that regard, the ‘more of the same’ mentality ultimately deflates some of the expectations that we had going into the sequel, coupled with some new character additions that mess with the original film’s strong cast cohesion. Gone is Lauren Graham. Gone (RIP) too soon are both John Ritter and Bernie Mac. Instead, we are handed the likes of Kathy Bates, who unsuccessfully attempts to out gross-out Billy Bob Thornton’s “Willie” as his mother- probably the film’s most glaring deterrent- and Christina Hendricks (“Mad Men”), who does a serviceable job in her role, but it takes a fair suspension of disbelief to think that she would somehow fall for the grotesque part-time Santa that Thornton portrays in any universe. Fortunately the triumphant return of “Thurman Merman” (Brett Kelly) absolutely makes ‘Bad Santa 2′ worthwhile, with the sort of innocence in the face of obviousness that yields the film’s most uproarious moments. 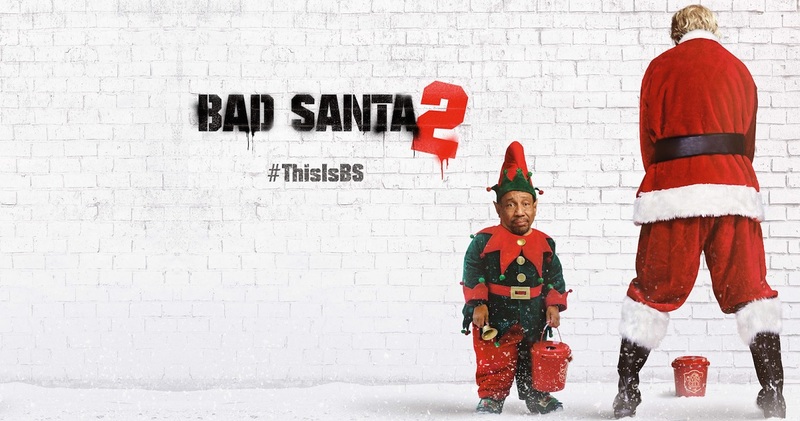 While many of the movie’s jokes hit, seemingly just as many of the miss- and miss badly- and the premise that ultimately unfolds is fairly obvious within ‘Bad Santa 2′s’ first twenty minutes. Thornton’s little-person partner “Marcus” (Tony Cox) reprises his signature role from the original, though again, the jokes that run at the expense of his height seem to be used far too often as a crutch as the film unfolds. With the original managing to find good fortune in the darkness of a bottle of ‘Old Grand-Dad,’ ‘Bad Santa 2′ plays out as a watered down version of its predecessor- with less compelling characters, a predictable story line and punchlines that are uncomfortable rather than laugh inducing. And still, all that said – as far as sequels go, ‘Bad Santa 2′ is certainly watchable. Not nearly as unique as the original, the film taps into just enough goodwill for fans of the first movie to appease that dark-holiday movie appetite. It’s nice to see ‘Willie’ and ‘Marcus’ back together again, planning out their latest heist. We just wish the circumstances surrounding it would have been more carefully constructed. “Bad Santa 2” starring Billy Bob Thornton, Kathy Bates and Christina Hendricks is rated R, has a runtime of 92 minutes, and is in theaters everywhere now.